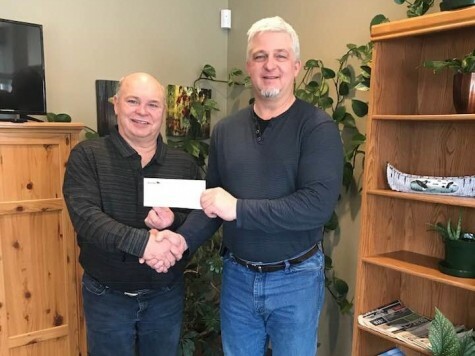 February 1, 2019: Rick Wowchuk is pleased to be able to present a $19,000 cheque this morning on behalf of the Minister of Agriculture the Honourable Ralph Eichler to Veterinary Board Member Stuart Walmsley. The Government of Manitoba is pleased to support the maintenance and operation of the animal hospital and the provision of resident veterinary services through this grant. This program continues to have beneficial impact in providing farmers with needed veterinary services and thereby on the overall agriculture economy.